08/28/2018 MNL48 Senbatsu performs 3rd Tagalog version of AKB48 song Another AKB48 popular song Skirt, Hirari is translated into “Skirt, Hirari – Umiindak Na Saya” and performed live by MNL48 Senbatsu for the first time on August 25, 2018 at ABS-CBN’s It’s Showtime. The top idol group in Japan, AKB48 first released Skirt, Hirari in 2006 and sold more than 20,000 copies making it at No.13 for six weeks at Oricon Chart. “Skirt, Hirari – Umiindak Na Saya” was first heard in their debut single press conference. Now, the MNL48 Senbatsu are excited to share the Tagalized version of their sister group’s best-selling songs through their first album, which will be released soon. “Skirt, Hirari – Umiindak Na Saya” is one of the songs included in their album under Hallohallo Entertainment Inc. (HHE) and Star Music. The album also has additional instrumental versions of the songs to complete the six-track record. As center girl Sheki encouraged everyone to buy their album, fans have a chance to be part of the idol group’s upcoming handshake event exclusively for those who purchased the CD. Moreover, Abby announced that a second series of limited edition photocards of the MNL48 are now available on mnl48.ph, the official website of MNL48, and an updated version of MNL48 Fan Club app is launched today and now available on the App Store and Google Play for free. One week after the release of MNL48’s first music video on the noontime show, the video earned 234,070 views on Youtube and more than 600,000 views on Facebook and garnered positive comments from international fans as well. Additionally, as part of their promotion of their first album, MNL48 Senbatsu members will also be performing as special guests at the 1st Manila Idol Matsuri 2018 on September 2 at Makati Square, Makati City. 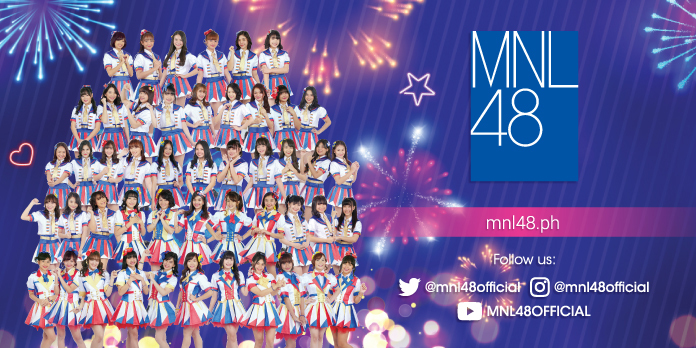 Keep on following the MNL48 official website and social media accounts to find out the latest news and updates about your Oshi.